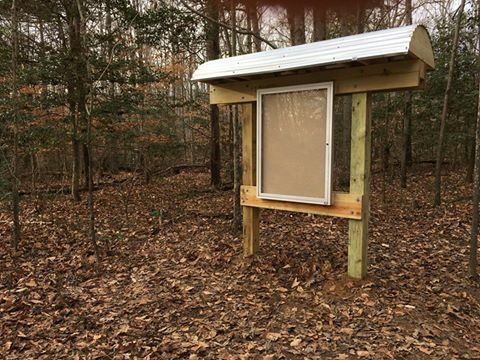 By now you surely must have noticed our brand spankin’ new kiosk on Fall Hill Ave. or perhaps the new one at the trailhead of Snuffleupagus at Mott’s Run Reservoir. 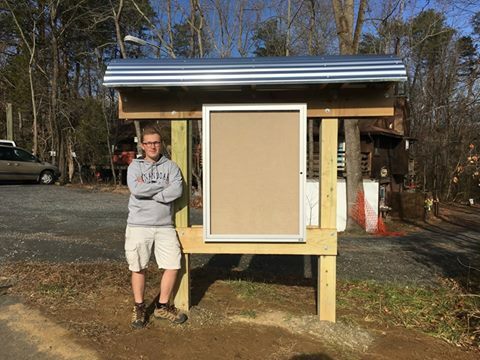 We are very proud to have had Mr. Carter Boyd complete his Eagle Scout project with the help from Troop 179 this winter for what we believe is a solid piece of work for the worthy cause of providing the public notice of trail events on our local trail systems. (If you would like your local business logo and contact info up on these kiosks and on our new website, give us a holler at connect@fredtrails.org). Carter, thank you so much and best of luck finishing up high school and preparing for college! Never stop being amazing. We also need to give a big shout out to the City of Fredericksburg’s Pathways Steering Committee members for helping fund this project with us. Thanks everyone!